The 9 Best French Restaurants in Utah! French food is one of the most diverse cuisines in the world. With regional delicacies, fabulous cheeses, and a near monopoly on wine, French fare is bursting with mouthwatering offerings. Check out the best French restaurants in the Beehive State! La Caille has a reputation in Utah for being a beautiful and delicious restaurant. With its own winery, elaborate French-inspired dishes, and a French-chateau façade and interior, La Caille feels like Disneyland and France combined, which is possibly the best combination imaginable. Franck’s Restaurant has a fan-base like none other. Because yes, the food is amazing, the location spot-on, and the classy atmosphere is exactly what you would expect from a French-inspired restaurant. At Franck’s, you get what you pay for. As with most French restaurants in Utah, the Paris isn’t exactly a strictly “French” restaurant. The restaurant offers “New American” cuisine that is inspired by Mediterranean and French flavors. That said, the Paris’ French vibes are on point, and tucked away in the cutest corner of Salt Lake City, the café will give you the European experience you crave. Locally run by a French family with Lyon-bred culinary expertise, the French Spot sells everything you miss from your last European vacation. Almond croissants, creamy gratins, crepes, quiche, and omelets—this place has it all and more. 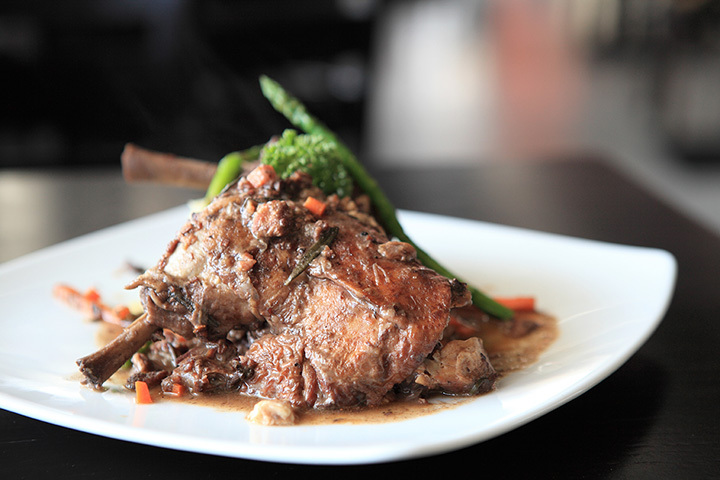 Much more authentic than any chain French restaurant, the French Spot can fulfill both sweet and savory cravings. With its beautiful blue French doors, Eva’s Bakery will catch your eyes from a mile away. And for good reason: the bakery/café is a Salt Lake City must, and especially for Francophiles. Selling French pastries, artisan breads, croissants, bakers pies, and sandwiches, the bakery will either inspire you to come back every week, or to book the next flight to Paris. Everyone knows there is more to France than crepes. But for many Americans, the crepe is the first thing they think of when it comes to French cuisine. Roll Up’s crepes manages to craft a product like those sold at Parisian crepe stands. These will be the crepes of your dreams! Labeling itself as a boutique restaurant and coffee shop, the Crêpery focuses on exactly what its name suggests: the crepe. With savory and sweet crepes, as well as a charming, youthful ambiance, the Crêpery is a great date spot or even a viable dinner option. Its savory crepes are filling, healthy, and loved by anyone who is lucky enough to get their hands on one. Famous for its award-winning Kouing Aman (a flaky, sweet French pastry that originates from the Brittany region of France), Les Madeleines is more than just a French bakery. With French inspired breakfast and lunch options, you can come here for a delicious sandwich and leave with a bag full of delicious French pastries. Located up Big Cottonwood Canyon just east of Salt Lake City, St. Bernard’s is technically part of Solitude Mountain Resort. The restaurant’s menu changes nightly, but the buffet selection is always to die for. This is a French fanatic’s gastronomical dream.